Home ICO DropDeck.io Crowdsale Whitelist – Just Started! The increasing amounts of ICO and TGE based fundraisers are providing an ample amount of opportunity and risk to potential investors. ICO’s are started almost every day, and this is one of the major issues. Since anybody can start an ICO, a platform that can manage all of the known information about the ICO/TGE is necessary. This platform needs to be an incentive-leading system that rewards correct information, transparency and promotes safety. We will talk about this system later in the article! Right now, let me introduce you to DropDeck.io. Welcome to the transparent investment information platform. Developed as a part of IBM’s Watson AI XPRIZE Competition, DropDeck.io strives to combine world-class A.I. algorithms in combination with blockchain and incentivized oracle inputs from real people. The final product is a decentralized platform that informs investors, helps businesses get funding, and creates new information-based roles that are designed to provide relevant and immutable information about the companies, individuals, and potential of any specific token sale. This benefits all of the stakeholders and provides rewards for each benefactor when companies get funded. Crowdsale participants will receive Decentralized DropDeck Tokens, i.e. DDD. These tokens will be used by the platform to delegate all of the arrangements necessary for the effective performance. The public is incentivized to take the necessary actions that lead to a better platform for investors. Granted, this positive feedback loop between investors, fundraisers and the ecosystem will result in attracting, even more investors, will increase the value of the DD token, and further contribute to the creation and maintenance of innovative small to medium enterprises. The tokens will be used to facilitate the investments, and to provide the rewards for people that support the investment process. As part of their reacquisition strategy (detailed in their whitepaper) DDD tokens will be purchased back through a smart contract from exchanges, and this will maintain and increase their value. Funding your next business enterprise through DropDeck is going to be a significantly different experience than traditional venture markets can offer, mainly due to their unique smart contract enforced 10-step process. A “Hunter” finds a potential company for funding and post it to DropDeck. 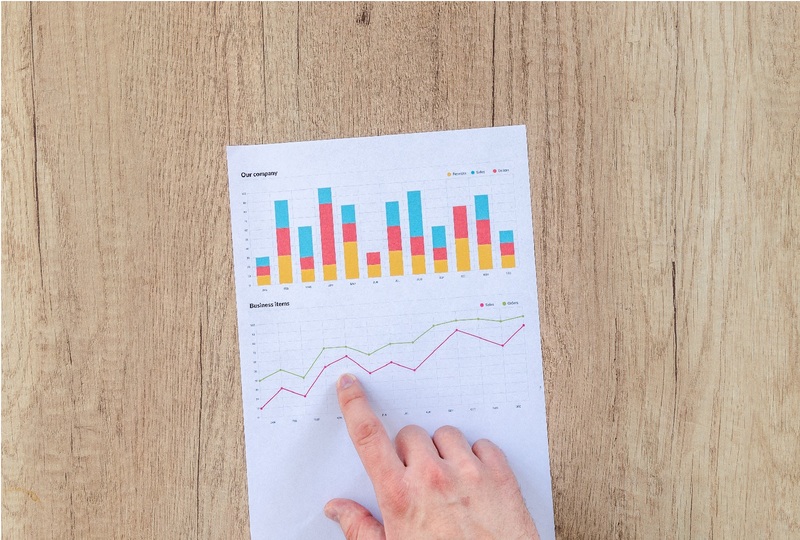 “Evaluators” provide their insights about the company, detailed information. This affects the score and the rating of the investment possibility. 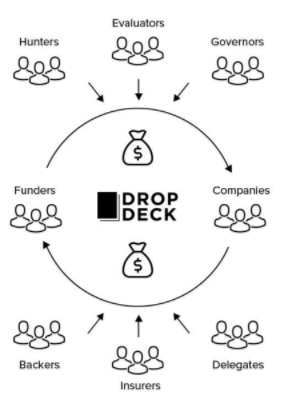 Investors explore DropDeck and find a suitable company that they want to invest in. In order to unlock additional information shared by evaluators, a DDD fee needs to be paid, which in turn is shared with the evaluators. Investors that settle on a decision to invest, send DDD tokens to the appropriate smart contract. “Delegates” are individuals that conduct due diligence about the fundraising company, they are physically close to the fundraising company. They represent a bridge between the investors and the company. The delegate is approved by the company and the investors and becomes an integral part of the smart contract. Once the delegate is approved by both parties, the smart contract transfers the DDD tokens to the fundraising company and the original hunter. The Delegate goes through the legal arrangements to make it possible to enforce repayment at a later date. At this stage, the company is already financed and is now repaying the DDD back to a different smart contract designed for loan repayment. The loan is completely repaid. The smart contract executes and rewards the original investors and the delegate with an appropriate amount of DDD tokens. You can also find a graphical representation of this process in the whitepaper. In about 12 hours from the moment of writing, the doors will open and you, along with thousands of other investors will be able to participate in one of the most important moments of generating this valuable platform. The DropDeck team is making the entire process extremely secure by maintaining full KYC/AML compliance, to ensure that investors get their tokens and that everything will go smoothly during the 30 days of crowdsale. This whitelisting process enables the safety of all investors, of the team, and of the assets that are being put into the platform. Only BTC and ETH will be accepted, but for more details, you can check out their website, or whitepaper. Next articleThe number of applications for tokens exceeds the supply by 5 times. How did Universa manage to blow away the cryptocurrency market again?